Yo I am not kissing, I had the best stay here! The people were nice, the location was great and the overall vibe was amazing! 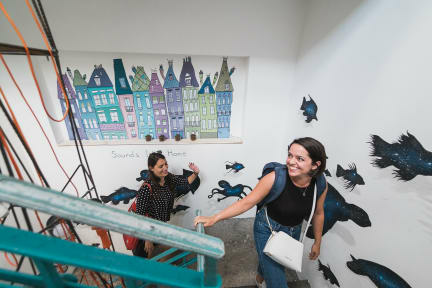 Geweldig hostel, ik heb inmiddels heel wat hostels gezien over de hele wereld maar zo vriendelijk en meedenkend als bij Madame Hostel is echt zeldzaam. Gratis welkomstdrankje, top WiFi, prima bedden, hele leuke staf, lekker eten en alles zeeeer betaalbaar. Waren ze allemaal maar zo..
Het Madama Hostel is supe om te verblijven omdat je net buiten het centrum zit waardoor je meer met de lokals in contact komt. Het is trouwens maar 5 minuten lopen naar het metro station en met 10 minuten sta je in het centrum van Milaan voor de Duomo. De sfeer is in hostel is zeer goed en het is super makkelijk om met mensen in contact te komen. Ook worden er 's avonds activiteiten georganiseerd. Groot pluspunt is het gratis ontbijt EN avondeten! Ik zal zeker weer verblijven bij Madama Hostel!! We booked a 6 person female dorm room for one night. It was very clean. Breakfast and dinner are included and are very nice. The staff is great. Madama has become my second home! Great atmosphere, great food, great staff. Really pleasent personal, which you can always ask quations and they will do their best to help you. They did some research on internet for me and called arround to rent a scooter for me. Cosy atmosphere without any timebonded restrictions. Everything you need is provided! Perfect place to stay. Its a little different than i'm used to with hostels. Arriving feels like entering a bar/pub! So its easy to get to know other travellers and even to meet locals! Great atmosphere! Very helpfull and friendly staff and good food as free breakfast and dinner. Would very much reccomend this place and would love to come back! The hostel is amazing. Its located a bit out of the center, but the metrostop is just close-by. It actually didn't bother me. The rooms are clean and spacious, with a locker (bring a your own lock) a power and usb plug next to the bed. The free breakfast and free dinner (aperitivo) are the best. Since downstairs is a cheap bistro and bar, a lot of locals visit it as well. I would stay here again. 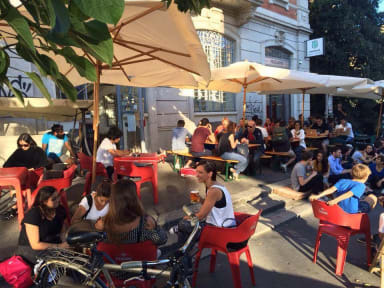 Awesome hostel in almost every way, and brilliant that it's combined with a bar; during apiritivo is easy to make friends. But the noise at night: terrible!